Last week the European Court of Human Rights produced a landmark decision in Al-Skeini v. UK, a case dealing with the extraterritorial application of the European Convention on Human Rights (ECHR). What a mouthful of legalese this is, you might think – so let me try to clarify things a bit. The main purpose of human rights treaties like the ECHR is to require the states that sign up to them, say the UK, France or Turkey, to respect such things as the right to life and legal due process, and prohibit the torture, of people living within the UK, France or Turkey. But what happens when the US detains foreigners on foreign soil (Guantanamo), or kills people in Yemen, Pakistan, and Afghanistan with unmanned drones, or a former Russian spy is poisoned in London ostensibly at the orders or with the collusion of the Kremlin? The question that then arises is whether all these individuals have rights under human rights treaties against the US, the UK or Russia, even though the alleged violations of their rights did not take place in the US, the UK or Russia. This question might appear to be counterintuitive. Human rights are, after all, supposed to be universal—why should it matter whether a state violates a person’s rights by acting within its territory or outside it? At the legal level however it is a matter of treaty interpretation. The scope of application of many major human rights treaties, including the ECHR, is defined by a very similar clause: the persons concerned must fall within the state’s jurisdiction for that person to be able to raise his or her rights against the state. Courts both international and domestic have produced mounds of conflicting case law on how this is different from the state’s territory, with two main strands of decisions defining ‘jurisdiction’ either in spatial terms, as state control over territory, or in personal terms, as control over individuals, with a number of deviations from these two models in between. These contradictions flow partly from the vagueness of the legal concepts, but, also more importantly from conflicting policy considerations. On one hand, courts want to follow their human rights-friendly impulse and protect the individual affected by extraterritorial state action. On the other, courts fear political fallout, and therefore choose to unduly restrict the extraterritorial application of human rights instruments, often on seemingly completely arbitrary grounds. The Al-Skeini case with which I started this post is a perfect example of this tension. It concerned six individuals, all killed by British troops in Basra, in UK-occupied southern Iraq. One of them, Baha Mousa, was killed while in custody in a British detention facility after much mistreatment. The five others were killed in varying circumstances by British troops on patrol. Some may even have been killed in justifiable or at least excusable circumstances, but their families wanted the UK to conduct an ECHR-compliant effective investigation into their killings. They thus brought proceedings before the UK courts under the Human Rights Act, claiming that the ECHR applied to the killing of their relatives in Iraq. The House of Lords (now rebranded as the UK Supreme Court) held that only Baha Mousa was protected by the ECHR, as his killing took place in a UK military prison, which (I kid you not) was somehow analogous to an embassy (more on that here). As for the other five, they were held not to have been within the UK’s jurisdiction as the ECHR could generally not apply outside the territories of the states parties, and as the UK did not have effective control over Basra (jurisdiction defined spatially) because of the strength of the insurgency there. In all fairness to the law lords, in coming to this decision they had to follow inconsistent Strasbourg precedent and they were certainly aware of the difficulties of applying the ECHR in a business-as-usual kind of way in war-torn Basra. In its judgment from last week, the European Court tried to bring its jurisprudence on this controversial issue on a somewhat surer footing, and found that all six applicants were protected by the ECHR (for a detailed legal analysis, see here), and that the UK failed to effectively investigate the deaths of all but Baha Mousa. In doing so, however, the Court opened up as many questions as it answered, something that will probably vex European foreign and defence ministries no end. Post Al-Skeini, other judgments of UK courts now stand in doubt, such as its decision in Smith that UK soldiers posted abroad are no longer protected by the ECHR against the UK the moment they leave a UK military base. 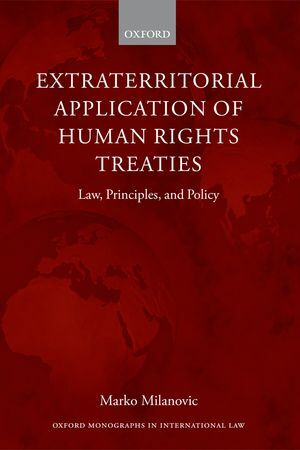 In any event, the extraterritorial application of human rights treaties will remain a controversial issue for many years to come. Marko Milanovic studied law at Belgrade, Michigan, and Cambridge, and is now a lecturer at the University of Nottingham School of Law. He is the author of Extraterritorial Application of Human Rights Treaties: Law, Principles, and Policy¸ and co-editor of EJIL:Talk!, the blog of the European Journal of International Law.